It was a lovely, pre-Easter weekend and I found myself walking around downtown Los Gatos with David. Lo and behold, Williams-Sonoma had a sign outside that caused a force stronger than I, one that practically pulled me into the store (20% off open-stock All-Clad D5? Yes, please!). I’m now convinced that this [magnetic] force is the very same that allows the pans to be used on induction burners, and it only grows more powerful when there’s a sale going on. Clearly I couldn’t help myself, right? I then, of course, proceeded to meander throughout the entire store (why waste the trip? ), and that’s when I first laid eyes on this single-purpose device, the cupcake corer. I was intrigued. After picking it up off the shelf and playing with it for a few seconds in order to figure out how it worked, I took a peek at the price and thought, only 5 bucks! Hmmm. This quickly turned into, 5 bucks for this simple device? No, not worth it, on to the All-Clad! It was hopeless, though, the seed was planted. Over the next few weeks, I found myself coming back to the thought of “what could I possibly fill a cupcake with?” over and over again. Dulce de leche? Eh, it’s fun to make but not my favorite thing to eat (and we all know it’s all about me — kidding!). Extra frosting? Too much of the same flavor and texture. Though, I do love frosting. It wasn’t until I was experimenting with the success-or-failure of baking chocolate cupcakes without paper liners that I knew exactly what I’d use the corer for: a faux-Hostess cupcake! I thought a whoopie pie type of marshmallow-y vanilla filling, whose sweetness would be balanced out with a bittersweet chocolate ganache would fit the bill — and here we have it! I ended up purchasing my corer through Sur La Table (the Williams-Sonoma I went to weeks later didn’t have any in stock, and I was in a rush to get one before the bake sale), and I love it! It’s not just a glorified round cookie cutter. My favorite part is how the wide, plastic flower part allows you make holes with a consistent depth. Plus, it comes apart so you can clean both halves really well. It’s really the small things in life that excite me. Using a cupcake corer, remove centers from the cupcakes, set aside for another use (a.k.a. samples for the baker!). 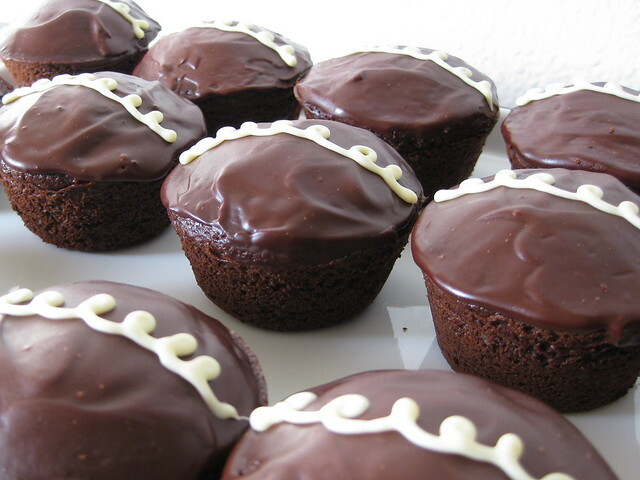 Place cored cupcakes on a large platter or several plates, allow for about 1/2 inch of space between them. In the bowl of a stand mixer fitted with the whisk attachment, whip butter on medium speed until light and fluffy — about 1 minute. Add Fluff to butter and beat for 1 minute or until well combined. Add vanilla extract. With mixer on low speed, add powdered sugar; once the powdered sugar is incorporated, increase speed to medium, and beat for 1 additional minute. Transfer filling to a pastry bag fitted with a round pastry tip (Wilton #12). Pipe filling into cupcake cores until level with the top of the cake. Transfer filled cupcakes to the fridge. Once filling is firmed up a bit (about 30 minutes – 1 hour), gently pat down any peaks in the filling with your finger (it shouldn’t stick to you — if it does, they need to be chilled longer). They are now ready for the ganache. In a small saucepan, warm cream over medium-low heat, stirring occasionally, just until you see a bubble come to the surface. While cream is heating up, place chocolate in a heat-proof bowl. Pour hot cream over chocolate and let it sit for a minute; gently stir until all of the chocolate is melted. Place bowl with ganache over a small pan of barely simmering water to keep it warm while you work (caution: do not let the bowl with the chocolate touch the water, if the ganache gets too hot it will separate, so keep a close eye on it). Working quickly, spoon about 2 teaspoons of ganache over each cupcake, and spread to the edges using a small spatula (straight or offset, whichever you prefer). Allow ganache-topped cupcakes to cool at room temperature for 30 minutes to 1 hour (if you touch the ganache, it shouldn’t transfer to your finger). Chill completely in the fridge. Heat white chocolate over a double boiler until about 75% of the chocolate is melted. Remove bowl from the heat and stir until smooth. Transfer chocolate to a pastry bag fitted with a small, round tip (Wilton #2). Pipe seven squiggles across the tops of the chilled, ganache-covered cupcakes. Chocolate should harden instantly. 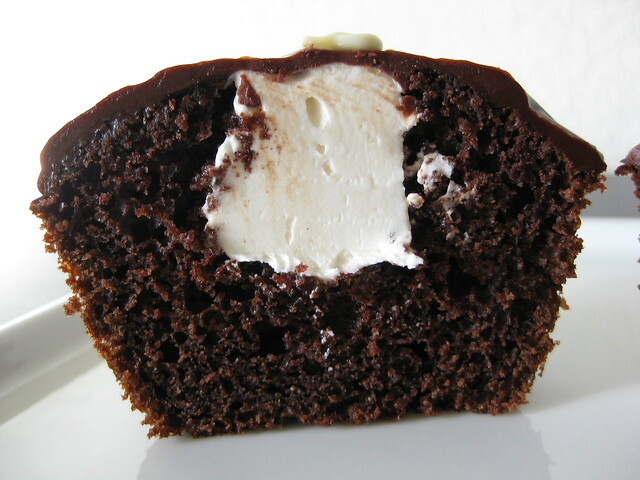 Once ganache and white chocolate are hardened, cover cupcakes and store in the fridge. Remove cupcakes 30 minutes to 1 hour before serving. ¹ Genuine, Marshmallow Fluff is a non-negotiable. Marshmallow crème is not at all the same thing. If you’re on the east coast, I’m guessing you know where to find this stuff since most grocery store chains carry it down the peanut butter aisle. For the rest of us, Cost Plus World Market recently began stocking this wonderful spread in the baking aisle (for locations click here). You can also purchase it directly from the producers through their online store. They also have a “Fluff Finder” here. ² I like E. Guittard Bittersweet Chocolate Wafers (72% cacao). Available at Whole Foods (about $7/pound on sale), Sur La Table, and their online store. Their allergen statement can be viewed here. ³ I’m torn between Callebaut and E. Guittard White Chocolate Wafers (31% cacao). I’ve found Callebaut sold in 8-16 ounce blocks at Whole Foods and Drager’s Markets. Guittard wafers can be purchased at Sur La Table and through their online store. I loved this type of cupcake as a kid and I love it now! Ah, I had a similar encounter when walking past Sur La Table here in Washington, DC! I saw the corer, thought, “$5 for a little plastic toy? !”–but then walked around the rest of the store and kept daydreaming about cupcake-coring. Alas, I, too, purchased the little tool, and this recipe of yours seems like the perfect way to test it out! Thanks so much for the post (and to foodbuzz, to leading me here)! Apron Appeal: Thanks for stopping by! It’s so interesting what sticks with us from childhood. RavieNomNoms: Thank you! I find nostalgic foods hard to resist, too :). Seema: I’m happy to hear I’m not alone! Thank you for reading and commenting. Happy cupcake-coring! These crush Hostess! Fabulous! Congrats on the top nine! Well deserved. Thanks Lisa, you’re too sweet. I really appreciate the kind words!